Today in the mail I received a set of clone armor that I bought on eBay. Unfortunately I cost me around $900 total but it was worth it. I have the full suit including boots and undersuit. Right now I only have a picture of me in the top half because I need to adjust the rest of it to fit me. I will have more pictures later, but right now it is late. I plan on joining the 501st now when I'm 18. Here are the links to my other helmet galleries until I fix the whole link thing since maj became majhost. $900! You can buy a small car with that! However, the suit does look pretty cool. And I am sure some girls really dig 501st troops, you know what I mean? Here is my full set of armor. The set is fitted to me now and I plan on wearing it to the premiere of The Clone Wars. I would have gone to midnight madness in it if there was a Toys R Us near me. I'm currently building a DC-15s blaster to go with my armor by modifying the toy version that shoots the foam darts. Sweet costume. Do you know where it came from before you bought it? Like where it was made and everything? I'm not sure where the armor came from. I'm pretty sure it was just an ABS kit. 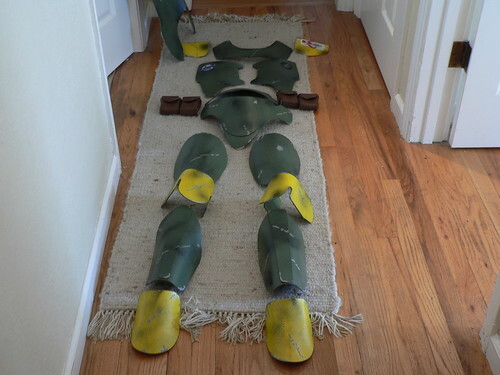 The previous owner who was a 501st member is probably the one who assembled and painted it. I plan on joining the 501st when I turn 18. And yes HoboBob1138, I am a little skinny to be a stormtrooper. I have a question, do you know what the black lining is on the costume, and how does it connect to the armor, I have always wondered that. Is it like pantee hose material or Under Armor or something?? The undersuit is like under armor. It is a full suit and the armor is not actually attached by velcro or anything. The armor just goes over the suit. The thigh armor (in case you are wondering) is attached to the lower body piece by a black fabric strap. The shoulder bells are attached to the chest piece in a similar way. Hmm, very nice. Looks a little loose on you but then most of these kits are molded for an adult. My Mando'a armour is for an adult and yet it fits pretty well. Probaly because I'm quite stocky. Still haven't finished my armour repaint but I'll be sure to post them when their done. Took some pictures of my armour finally. Haven't painted it yet, but going to start on it this week. That is a sweet Mandolorian armor set. Props for the paint job. I finally got around to digging up the cable to attach my camera to the computer. I have some pictures from the premiere of The Clone Wars. This is the armor's currently resting place. I cannot find a cheap full body mannequin. Here is just a shot of me goofing around in my house. This is me and some friends in the parking lot before the premiere. You look like a under fed clone. Sweet! That is a really nice set of armor you have there. I like the battle worn look. It looks a bit gappy around the crotch, but I guess that beats the alternative. This weekend I was out of town at my aunt's wedding. For some reason I was able to persuade my mom to let me take my clone armor and the hilarity ensued. At the reception, there was a informal dance and that is when I showed up in the armor. My grandmother had requested the dj to bring the Star Wars theme and that is what I entered to. Then the dj switched to some country dance song (I'm not into country but the song wasn't bad to dance to) and I danced with my aunt and new uncle. It was hilarious. I wish I had a video of it, but I'm lucky I got pictures of it because my dad was laughing so hard. Here I am with my aunt, uncle, and my cousin with my Stormie helmet. Me square-dancing with my uncle. Hehe, that's awesome. It's great your Aunt was cool with it.